The lights are unstrung, the ornaments are packed away, and all the Christmas cookies have been eaten. And my house looks a little sad. I need some winter decor and I need it fast! 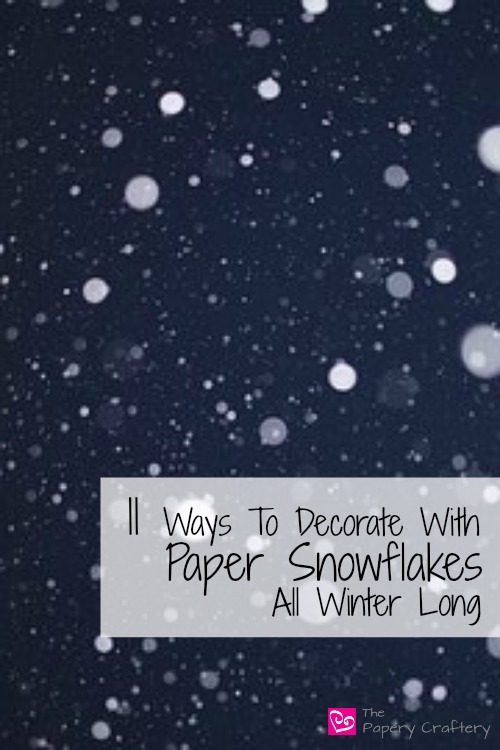 After a little searching, I’ve found eleven ways to decorate with paper snowflakes all winter long! The same folded and snipped snowflakes that we all made in elementary school can be transformed into beautiful winter decorations for your home that you’ll be thrilled with until spring. This snowflake window curtain from Bugs and Fishes requires some minor sewing skills, but the end product is stunning! Lesley Shepherd for about.com’s miniature page paper snowflake tree is a craft that I’ve never seen before! Haley from Life is Sweet added her snowflakes to her chandelier for some wintry dining room decor. With a little time and clear tape, You Are My Fave created the perfect winter snowflake table runner. Krokotak has designed some lovely ballerinas with delicate snowflake tutus. Perfect for any former, current, or want-to-be dancer! Or try a more advanced version called medallion snowflakes from One Dog Woof. Hello Naomi used paper doilies for her snowflake garland for a girly, lacy twist! Add snowflakes to your winter birthday packages like Giochi di Carta! How About Orange made her snowflakes with a bright color pop! Or try using magazine or book pages for an upcycled paper snowflake gift bag like Margot Potter for the I Love to Create Blog. I wish I had enough wall space to cut some enormous snowflakes like these from Oh Happy Day! And just in case anyone needs a little review or inspiration on cutting paper snowflakes, I’m adding a few tutorials I’ve found! And some pretty advanced patterns from UsefulDIY.com. Now that you’re inspired, learn to make your own handmade quilling paper snowflakes today! There are a bunch more snowflake decor ideas out there! Follow my Pinterest board to see them and get inspired now! I 💜 your page. Thank you I needed it. Thanks Carolyn! I’m glad you’ve found it!